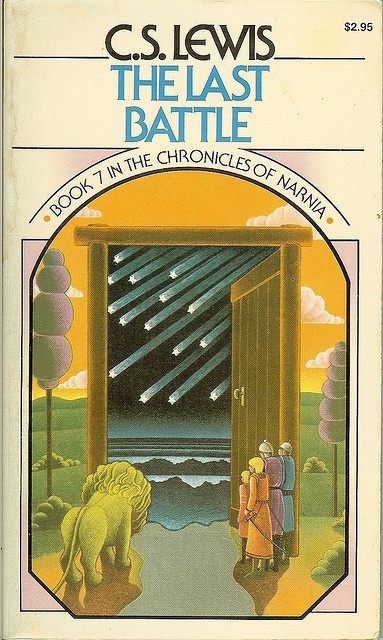 I would say The Last Battle, as the last book of The Chronicles of Narnia. Because really, I’ve been meaning to read the entire series for years, and it took me a few years to finally get through them all once I finally had the courage to start Prince Caspian after worrying that it just could not be as brilliant as The Lion, the Witch, and the Wardrobe. The Lion, the Witch, and the Wardrobe is still my favorite because it started it all and is really the best stand-alone story. I think The Silver Chair is absolutely great, however, and comes in a very close second. The Voyage of the Dawn Treader, however, is slow at the beginning, but thankfully picks up later, and unfortunately, The Horse and His Boy does very little for me and I am not sure if I understand what it contributes to the story overall. Any other Narnia fans out there? Which of the books is your favorite? Or, what book did you put off for a long time before finally diving into it? I’ve only read The Lion, the Witch, and the Wardrobe and The Last Battle when I was a kid, and I still don’t know why I skipped the rest of the books. Haha. I’m planning to read the whole series soon! And in the right order! Ha ha, sometimes these things happen! Some people like to read the series in chronological order, but I did it in the order he wrote them and had no problem with jumping around the timeline. My husband has a few of these books and I’ve been trying to decide if I want to read them. They are pretty short, so I might do it one of these days. I didn’t realize there are 7! And now I’m really curious about The Silver Chair, since you’re ranking it right underneath The Lion, the Witch, and the Wardrobe. Yeah, they are definitely quick, easy reads. I was surprised that I liked The Silver Chair so much since I had mot really heard anyone talk about it before, but afterword I did find a friend who agreed with me that it was one of the best of the series. Interesting book…love the cover. Haven’t heard of this. I read the entire The Chronicles of Narnia series years ago. Read them straight through as a series. About time to do it again! I haven’t even finished The Horse and His Boy XD It was sooooo boring to me when I tried to read it. So, technically, I’m in the boat of needing to finish Lewis’ series too… lol!! I do think The Horse and His Boy is the most boring. But once you get through it everything else is much better! I have been thinking about reading this series. I know! Everyone else has. I will! One day! LOL! Great post!